It's the simplest, safest of questions, but every time someone asks it, I nod and smile and buy a little time. It's not that I don't have a nice, concise answer... it's just that the answer doesn't answer, not like "I'm an accountant." I do sometimes go with, "I'm a consultant," but that just postpones the inevitable. 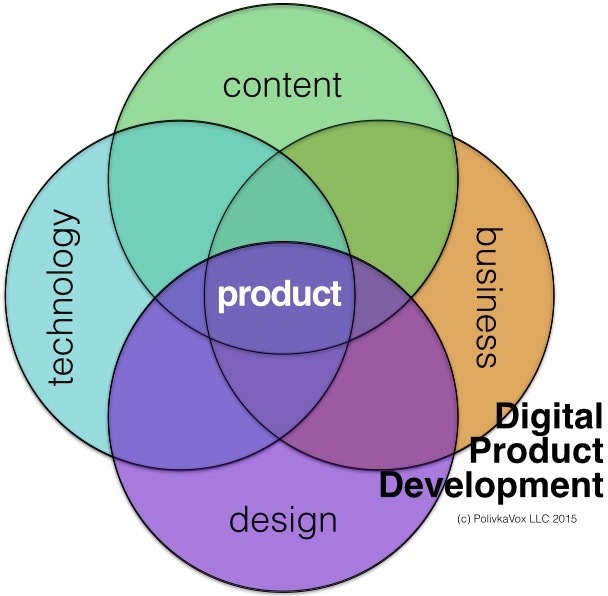 The tightest answer is this: "I do digital product development in the learning space." But to most people that's meaningless, like saying I'm a creativity analyst for nonlinear investment properties. Huh? And so I pause a moment in order to assess... just how interested are you, really? Assuming they are in fact interested, I elaborate a little: See, I create web sites and courses and videos, all kinds of products and services for clients in higher education, schools, continuing ed, publishing, corporate training. For teachers, students, nurses, doctors, lawyers, accountants, car salesmen... you name it. The audiences differ, the clients differ, the content differs, and the products differ, but what I do is always the same... 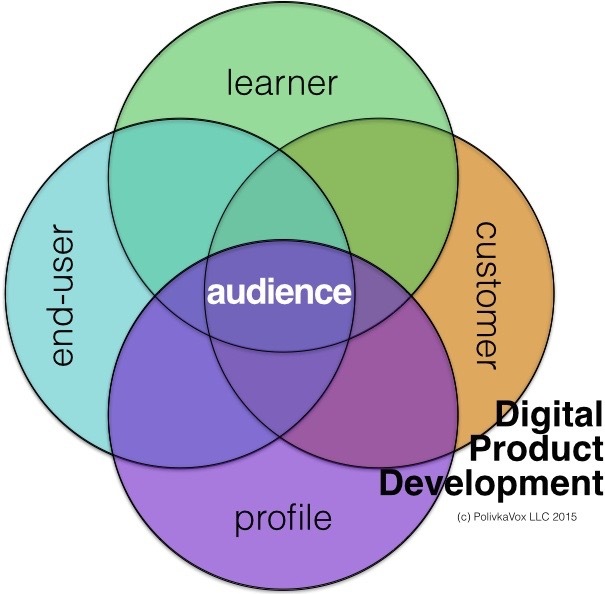 I build digital learning experiences that the target audience needs and wants, while meeting the requirements of educators, technologists, and business people. Oh, right. Polite nod. So... you write software? Sigh. What I often end up doing is attempting to describe orally this visual. I work in the middle. I bring together all these different tribes... experts from business, education, technology, design. They have their own cultures, language, values, and attitudes toward one another (not always friendly), and someone has to bring all this together into something that works for each of them. This someone has to know how to develop a product through a process. That's me. I don't know the depths of each color, but the product that emerges from all the colors. "Look, I need to have final say, because I'm the one who understands the content. And that's what this is all about." "You can't have final say over the technology. I'll tell you how it works, and you pump your content into my structure. We'll be fine." "Pump in the content? Without a good design, they won't like it, and if they don't like it, they won't care about the content or the technology. The design is everything." "Well and good, but what happens when the thing starts losing money? Then nothing else matters. I've got the bottom line, so I've got the final say." Without a product developer, one of those people wins that argument. And that is a very bad thing. It leads to a skewed, limping thing in the middle. So how do you keep someone from winning the argument? The secret is to flip the model, focus it not on the production process or the inputs, but on the audience and their needs. They are the highest authority. Each tribe is ultimately responsible to make sure that their own area of expertise is applied in the service of the product's audience. And that's something they can all agree on. Here's the same venn diagram, but with the audience at the center. The educator has to make it works for the learner. The technologist needs to be sure the end-user is happy. The designer has to think about the unique audience, whether that's working adults, college seniors, or fourth-graders. And the business person has to make it work for the customer. And in most cases, these are not different people, but different faces of the same person. An online student taking an executive education course, for example, is at the same time customer, learner, and end-user, while being a unique person within a targeted demographic. As a digital product developer in the learning space, I don't need to know everything about the technology, or the content, or be responsible for the entire business model. But I do need to know the target audience inside and out. I need to know the needs and habits and hopes and dreams of the learner, the end-user, and the customer. My authority, my ability to get all those tribes to work together, comes directly from the audience. I need the data, the research, the proof... because at the end of the day, my work is where audience and product meet. Not so complex, right? Not at all. Quite interesting. Knowing nod. Have you tried the crab dip?